The Organic and Printed Electronics Industry expects an increase of 10% in sales revenue in 2020. For this year, participants in the OE-A Business Climate Survey anticipate an increase of 9%. (Source: © OE-A). The signs are still set for growth in the organic and printed electronics industry, according to the latest business climate survey conducted by the OE-A (Organic and Printed Electronics Association). According to the survey, 73 percent of the participants expect the industry to continue its positive development in the coming year. The results of the survey, carried out for the ninth time, were presented to the international press at LOPEC 2019 – the international trade fair and conference – in Munich, Germany by newly elected OE-A chair Stan Farnsworth of NovaCentrix. During each survey, OE-A members – from material suppliers to end users – are asked to provide qualitative data on the state of the industry and their expected sales development. 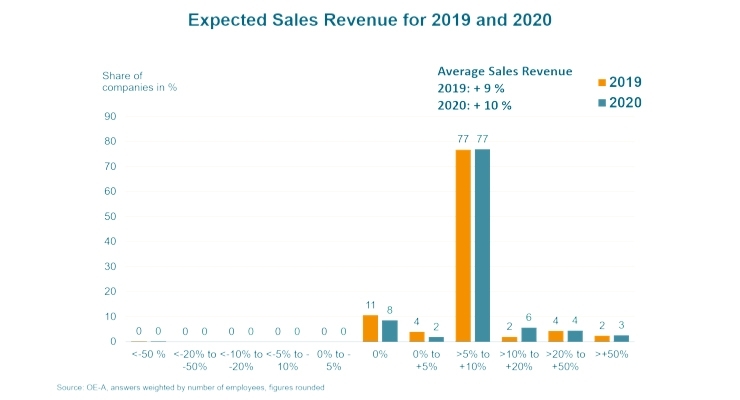 With a projected sales revenue growth of 9 percent, 2019 will be another successful year for OE-A members. This expected growth is 3 percentage points higher than anticipated in the forecasts from fall 2018. “The OE-A membership, comprised of leading participants of the printed electronics industry, are convinced that there will be year-on-year increases in business this year,” said Farnsworth. For 2020, a continuation of this positive trend within the organic and printed electronics industry is expected around the world. The companies expect further development and a stable growth in revenue of 10%. The positive forecasts for 2019 are also reflected in other areas. R&D shows growth: Nearly three quarters of the responding OE-A members plan to expand R&D activities within the next six months. According to the survey respondents, the investment in production as well as the employment situation remains stable within the organic and printed electronics industry. Thin, lightweight and flexible – these are the characteristics of organic and printed electronics. OE-A members target sectors such as packaging, lighting and energy, as well as the medical and pharmaceutical industries, and also place strong focus on the consumer electronics and automotive sectors. Especially in the latter two, electronics are playing an increasingly important role. “Key trends in the automotive industry include the rethinking of automotive interiors, with vehicles becoming ‘smarter’ and having more innovative information interfaces with the driver or passenger, all while being lightweight and taking up minimal installation space,” Farnsworth noted. As more operating functions, eventually including driving itself, are performed by on-board computers, the vehicle occupants will also interact more with information and entertainment systems in the car. In the consumer electronics sector, foldable displays and smartphones are currently the latest innovation. “OE-A members play a key role here, as they deliver the required materials, equipment and technologies, including for example the protective encapsulation of the OLED display materials,” Farnsworth explained.